D. Stephenson Bond writes a compelling and compassionate memoir of the ups and downs of everyday life as seen by a Jungian psychoanalyst who committed his life to the quest for knowledge about personality development in order to understand the mystery of his own near-death experience. Tracing the steps of each stage of personality development through which every life must pass from childhood to maturity, Bond reflects on thirty-five years of experience in Jungian psychology to tell the story of radical self-acceptance and individuation. 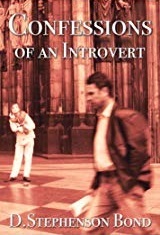 AVP author D. Stephenson Bond discusses the inspiration and the writing process for his new memoir Confessions of an Introvert. AVP put together a nice little animation which illustrates the principles found in our best-selling book Radical Frugality: Living in America on $8,000 a Year. AVP author Frederick Bell interviewed about his writing, his novels, and how he got the idea for The Battle for Tomorrow. The Battle for Tomorrow review by Midwest Book Review in May, 2011: "...very much worth considering for fantasy and science fiction readers..."
"No one faces extinction gladly. The Battle for Tomorrow is a unique novel of ecology, as author Frederick Bell tells a story of Ilon, one who is scheduled for extinction, as he looks to the hunted Egris for support, set in a futuristic world where animals can be scheduled for extinction by the dominant species. With a unique setting and a certain unique philosophy, The Battle for Tomorrow is very much worth considering for fantasy and science fiction readers." The Battle for Tomorrow launched May 1, 2011, the debut novel from Frederick Bell that tells the unique story of nature's revenge against an invasive species that happens to be technlogically superior. 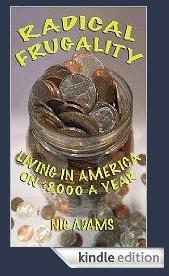 Buy the paperback on Amazon, or download the Kindle version. As of today, March 7, 2011, you can follow Frederick Bell on Facebook at Frederick-Bell. You can become a fan of The Battle for Tomorrow on Facebook at The-Battle-for-Tomorrow. "...Lilly: levelheaded 9/11 widow and blue-collar budding singer/songwriter with, understandably, some emotional baggage... who stumbles into Daniel's life when neither thinks the time is right for a relationship. And prompt the sprains and strains of Football games and Classical strings: Each finds that somethings gotta give in the way of easier-said- than-done compromises and the conflicts to be found in big-lug brotherly hugs and standoffish habits dying hard...Bond, who himself is a practicing psychoanalyst, has turned in a debut novel that in its references and allusions to myth and Jungian psychology floats and flows over fascinating and unique undercurrents..."
Commit just one evening of your life to financial freedom and this easy-to-read book will show you how to be debt free. Radical Frugality tells the story of 5 people did it: Paul, 27, discovering how to overcome student loan debt; David and Winona, late 40's, living their retirement dream today; and Dan and Charlotte, family of 4, with an underwater mortgage. Waking up every morning debt-free with cash in your pocket helps your brain feel safe, secure, and smart. What if nature's revenge needed a little help? Ilon knew in his heart what it meant to be scheduled for extinction, but how could he ever convince the Egris, hunted for their hides, to fight? The Battle for Tomorrow is a tale of deep ecology with a militant edge, of animal instinct colliding with technology in a battle where the stakes are extinction or planetary conquest. How do you go on your first date after losing your husband on 9/11? It?s been three years and yet Lilly struggles with hope and courage to meet the right kind of man who can help her find herself as a woman again. Kind of tall and kind of shy, Daniel is from another world in Lilly?s Boston, a Beacon Hill psychoanalyst with issues of his own. Healing Lily tells the unique love story of two people frozen in the winter of their grief reaching for each other, reaching for love they are too hurt to find. Sensitively written, this probing novel explores the aftermath of 9/11 on an intimately human scale reaching deep into the human psyche to touch on themes of the healing power of psychoanalysis and Francis Hodgson Burnett's The Secret Garden. Quote: This book introduces the concept of joint entrepreneurship in regional regeneration projects in Japan. Dr. Inaba provides significant new insights and theory which will be of great interest to scholars and practitioners of entrepreneurship, collaboration across organizations and regional development.